Why are women so catty towards one another? Laura, Laura Lavigne is a TEDx Speaker, Happiness Coach, author, director of the Anacortes Center for Happiness, and creator of the Happiness Sprinkling Project. Sitting all comfy in on a pillow on the floor, a few days ago, a question pops up from one of the women at my Soft Place to Land women’s group. Do you know why women are so catty towards one another? I am seated to her left, so I know that I will be first one to be asked my version of the answer to her question. My mind searches, rumbles, looks in nooks and crevices — and comes up with a blank. I cannot think of an answer because the question does not resonate as reality, for me. And I feel a little funny about it, a little bummed to not have anything interesting to contribute. Out of place. So I say just that. I say that this has not been my experience, so I cannot speak about it. And I simply pass the baton to the woman to my left. Who has much to say. As does the woman to her left. And the one next to her. By the time the fourth woman shares her experience about this woman-to-woman cattiness, something starts to bubble up for me. As much as I feel part of this group, I am also fully aware that I am the only one not having grown up in this country. Suddenly, I remember my pain and queasiness anytime I have seen the ubiquitous “mean girl cafeteria scene” show up in a movie. The part where girls won’t let another girl sit at their lunch table. Or any version of that same idea. When I see this on a screen, I am both incredulous and sickened. Before my kids were born, I thought that maybe it was a sort of myth, that it only happened on the screen. By the time my daughter was in middle school, I understood that this was very real, even though I could not — at all — understand it. As I sit in that circle and I open up to the idea that I really did grow up in a different culture, something lights up in my head, an idea starts to form, and before it is fully gelled, I need to share it. I want to run it past this group of women, I want to test this baby pink brand new theory, and I need their ears and hearts on it. So I let it spill, unabridged and not quite formed. Because finally, after 30 years, this thing is beginning to make sense. Proms. Homecomings. Cheer leading. So many opportunity for girls to be seen as popular, pretty. Or not so popular or so pretty. From what I understand, there is only one Prom Queen, right? Suddenly, I start to understand what might be happening, what might have caused (or at the very least greatly contributed) to this phenomenon of girls not being so nice to each other: COMPETITION. It seems to me that from a very young age, American women are pegged against one another, groomed to win… something. A tiara, a guy, a title. Something. Over another girl. It was as if the key had finally turned into the lock. See, in France, we have none of this. No Prom, no Homecoming, no school dances, no football teams. Heck we don’t even have yearbooks or reunions. We go to school to work, and then we go home. Any social stuff that goes on after school is something we create on our own. There is no school sponsored popularity contest, and any competition that might show up will have to grow on its own. And we sure as heck don’t have young girl beauty pageants. In fact, the French Senate legally banned that option three years ago. That’s a big, big deal. This morning, I share my theory with my daughter on the phone. She listens. And right then, in my kitchen, “the angle” shows up! What if this was some sort of intentional ploy? I am not much of a conspiracy theorist, and my theories usually runs more in the direction of thinking someone is plotting to do something really nice for me. But still. For a minute, I indulge. Stay with me. What if this was some sort of intentional ploy meant to divide women from an early age so that their united power does not take too much space when they get older? I have seen first hand — and continue to, every day — the power of women who love and respect each other. Even if they don’t always agree with each other. It’s a force to behold. We take care of each other, we make things happen in a big way. We vision, we create, we manage, we heal. Often times with joy as a propeller. That’s BIG. And that can be scary to some people. Divided, competing against one another, we are much more manageable. Really, I don’t know whether there’s a ploy at work, here. Probably not. This is probably just something that is part of the culture, with no more agenda than that. What if we resisted it? Or reversed it? What if we could find a way to let go of this competitive / scarcity based way of being? 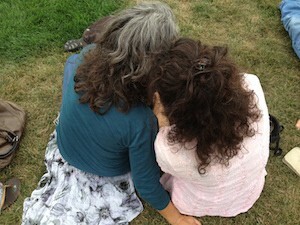 What if we made a move towards remembering our sisterness, our together-power? Really, our human-ness. What if by believing that there is enough for each one of us, we were able to just be, just play, just build, grow? Today, I invite you to take a peek at the places in your life where you may have bought into a spirit of separated-ness, of scarcity, or them-or-me. Wherever that may be. And then see if maybe this is not something that could be revisited, and possibly re-written. For more strength, more make-it-happenness, more ease, and also more fun. I wish you a lovely rest of the day.